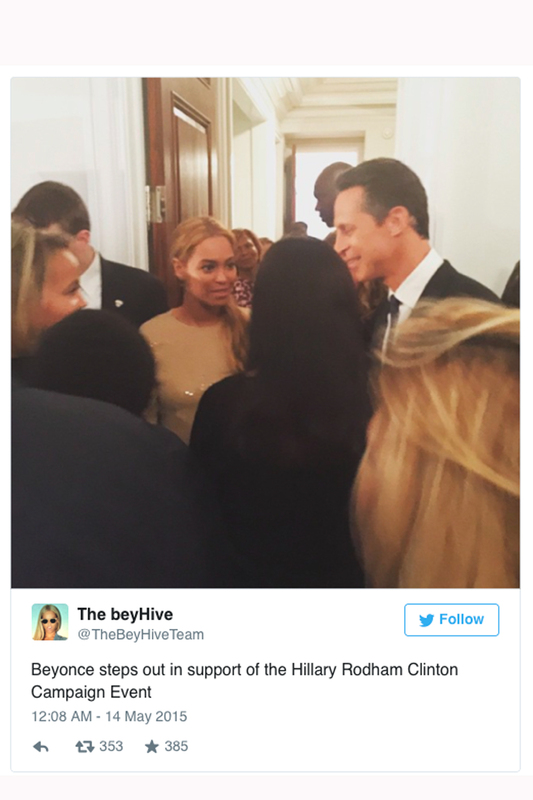 It’s only the start of Hillary Clinton’s presidential campaign but she’s already bagged herself the most important celebrity supporter of them all: Queen Beyoncé. The powerhouse singer made an appearance at a fundraiser for Hillary Clinton in New York City this week, at a bash hosted by Epic Records CEO, and friend of Jay Z, L.A. Reid at his pad in Manhattan. Tickets for the event cost $2,700 per person and other famous faces in attendance included Sharon Osbourne and Meghan Trainor (the girl who sings All About That Bass in case the name isn’t immediately familiar). Mrs Carter is the latest in a line of celebrities to endorce Hillary Clinton’s campaign, others include Lena Dunham and Amy Poehler. Of course, Beyoncé is no stranger to politics, having been a loyal supporter of Barack Obama during his presidential campaigns and time in office. The mega-star performed the national anthem at President Obama’s second inauguration, and in February she joined in with Michelle Obama’s #GimmeFive fitness challenge, celebrating five years of her ‘Let’s Move’ campaign. Are you #TeamHillary too? Here are 17 Hillary Clinton quotes that will truly inspire you.